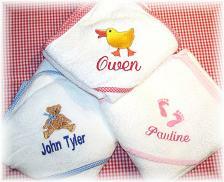 Personalized Baby Bath Sets. Super absorbent 100% cotton terry cloth hooded bath set custom embroidered with your choice of designs and personalized with baby's name below. Each personalized bath set includes a matching wash cloth and rubber ducky. The towel measures 30" x 36". Gingham Trim: Light Pink, Light Blue, Red or Solid White Cotton. Design: Select any design from the "See All Designs" Page. Lettering: Color, Style, and Case. OMG, we received this personalized bath set from my husband's employer. It is gorgeous, so soft and actually made me tear up. It was so special that they were so thoughtful and we will always appreciate their kind gesture. This is just THE BEST baby gift! I give this to every new baby in my life. Beautiful and incredibly practical. I hear that they are used for years. We recently received a bath set for our son newborn son. Unfortunately, there was some family confusion on the correct spelling of his name. I called Allison to see if we could send back the bath set to get it corrected and she sent a brand new (correct) towel and was incredibly gracious about the entire fiasco. You don't find customer service like this anywhere anymore! We are sold and will be back EVERY time we need a baby gift. Thank YOU so so much! We just love these bath sets! Thanks for such a wonderful product. This is the best baby gift ever. My son received one when he was born and we still use it all of the time, 5+ years later. Now I give it to every new baby in our life! I love the new softer material you used to make your towels. Very Plush :o) Super upgrade! We just love this bath set. After receiving one ourselves...it is the gift of choice for all the new babies in our lives. You really must love what you do! We just ordered one of these for my neighbor. My son still uses the one he got when he was born 5 years ago. It is his favorite. He uses it like a super hero cape. Such wonderful memories. My son received a personalized towel set for Christmas and we just love everything about it! We received this wonderful towel as a baby gift for our son, Troy. Three years later, it is still his favorite bathtime "accessory". Now we give it to all our friends who are having babies. What a joy to give something you know will be used and appreciated. This is a great gift for a slightly older "baby'. When I am extremely tardy in giving a baby gift---I like to give this gift item. It seems that the parents love it even more! It stands out and is something fresh and new as baby starts to crawl about more and everyone starts to enjoy bath time. Hi, we received one of these towels 5 years ago for my daughter when she was born. She still uses it today. We love it so much that we are sending one to our cousin as a gift for her 2nd birthday. Thank you for a great product.